While water in the basement is a problem for any homeowner, it's worse if you have a finished basement. Water quickly damages traditional building materials and can cause mould growth in your basement. If your basement walls have been damaged by water, Advanced Basement Systems can help. We provide quality drywall repair with the inorganic EverLast™ Wall System. This completely waterproof material will ensure that your basement walls are protected from future leaks. If you've had basement water damage in London, Windsor, Chatham, Sarnia or nearby, call us at 1-844-320-1542 or click below to get a free estimate on drywall repair! At Advanced Basement Systems, we can repair the damage to your walls and floor with warrantied products at the same time we waterproof your basement! There's no need to call a separate contractor! If you need drywall repair or any other basement wall services, call us today for a free estimate. 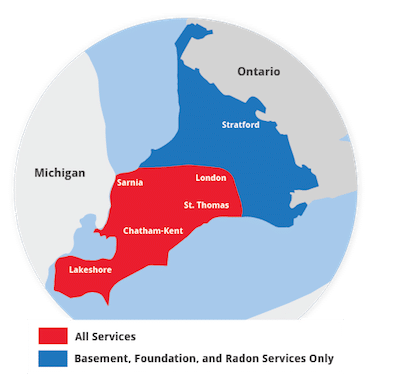 We proudly serve in Chatham, London, Sarnia, Windsor, Stratford, Windsor , Leamington, St Thomas, Amherstburg, Strathroy, Essex and throughout the nearby areas.